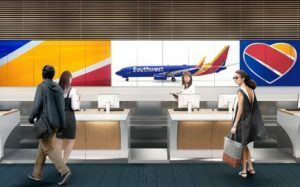 As part of Orlando International Airport’s $3.1 billion Capital Improvement Program, the North Terminal Renovation program is designed to revitalize the existing Main Terminal and consists of three components:. The ticket lobbies are being expanded and updated with self-assisted counters which increase throughput capacity and efficiency of passenger processing. This involves moving the exterior walls out towards the departures curb, replacement of the check-in desks with modular units, and replacement of the back-wall signage which will display a range of information including airline branding, flight information, security wait times and interactive entertainment for children. To improve navigation throughout the terminal the digital and static signage are also being updated and replaced. 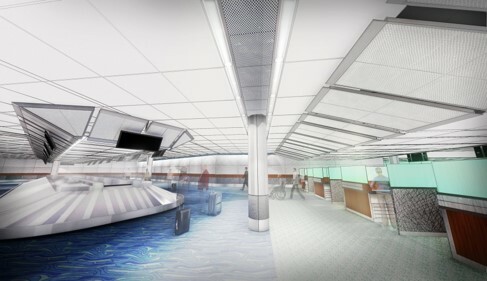 The first section of new ticket counters was unveiled in September 2016, with the last section scheduled for Fall 2017 completion. To cater to our rapidly growing international traffic, four current domestic gates on Airside 4 (Gates 70-99) are being converted to “swing” gates to allow them to be used for either domestic or international service, including the capability to handle the largest commercial aircraft currently being operated. The gates are scheduled to be operational in Summer 2017. The Federal Inspection Services (FIS) facilities are also being expanded to provide more space for Customs and Border Protection (CBP) officers and passengers being processed through customs and immigration. The expansion is scheduled to open in Summer 2018. The emergency power generation facility is also be expanded in the southwest corner of the Main Terminal at Orlando International Airport. This project consists of the expansion of the existing generator building to accommodate three additional generators to provide emergency power to the baggage handling systems.